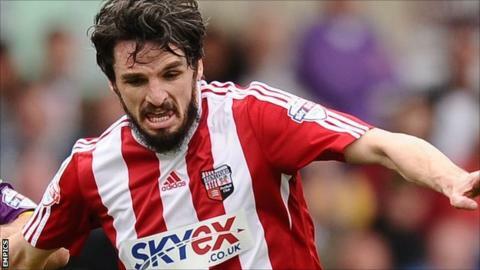 Brentford edged closer to promotion from League One after Jonathan Douglas' goal sealed victory over Crawley. Clayton Donaldson had two early chances for the Bees but missed the target twice, while Alan Judge's header was saved by Crawley keeper Paul Jones. Jones was at fault for the goal though, spilling Douglas' header into the net. Stuart Dallas twice went close to making it 2-0 as Brentford saw out victory to open up a nine-point advantage over Rotherham in third. And with five games left to play, Brentford know two wins and a draw will seal promotion to the Championship, with the Bees also three points behind leaders Wolves. The west London side's tally of 87 points is the highest recorded in their 125-year history. "These are the hard games and we knew they were going to be a tough opponent. They slowed the game down and we had to respond to it and not get impatient. "There was good fortune and we had to fight for it. "From our point of view it is one game at a time. "Our long-term target is to fill our new stadium. To do that we need to set new records and it is another step forward towards our goal." "We came here with a plan and it had 0-0 written all over it in my view, which would have been a good result for us. "They are a hard team to play against and they are almost certainly going to be automatically promoted. We made a monumental error which has cost us. "Obviously the mistake by Jonesy (Paul Jones) has cost us from a fairly easy header and it was game over. "It was a very disappointing way to lose a match." Match ends, Brentford 1, Crawley Town 0. Second Half ends, Brentford 1, Crawley Town 0. Hand ball by Matt Tubbs (Crawley Town). Josh Simpson (Crawley Town) wins a free kick on the left wing. Corner, Brentford. Conceded by Paul Connolly. Substitution, Brentford. Toumani Diagouraga replaces Adam Forshaw. Corner, Brentford. Conceded by Sergio Torres. Attempt blocked. Jake Reeves (Brentford) right footed shot from outside the box is blocked. Attempt blocked. Stuart Dallas (Brentford) right footed shot from the centre of the box is blocked. Corner, Crawley Town. Conceded by Tony Craig. Foul by Jamie Proctor (Crawley Town). Clayton Donaldson (Brentford) wins a free kick in the defensive half. Foul by Gary Dicker (Crawley Town). Michael Jones (Crawley Town) wins a free kick on the left wing. Attempt missed. Stuart Dallas (Brentford) left footed shot from outside the box is close, but misses to the left. Substitution, Brentford. Marcello Trotta replaces Alan Judge. Attempt saved. Stuart Dallas (Brentford) right footed shot from the left side of the box is saved in the bottom right corner. Adam Forshaw (Brentford) wins a free kick in the attacking half. Tony Craig (Brentford) wins a free kick in the attacking half. Foul by Sergio Torres (Crawley Town). Substitution, Crawley Town. Sergio Torres replaces Dannie Bulman. Substitution, Brentford. Jake Reeves replaces George Saville. Alan McCormack (Brentford) wins a free kick on the left wing. Attempt saved. Jamie Proctor (Crawley Town) right footed shot from outside the box is saved in the centre of the goal. Substitution, Crawley Town. Jamie Proctor replaces Billy Clarke. Goal! Brentford 1, Crawley Town 0. Jonathan Douglas (Brentford) header from the centre of the box to the bottom right corner. Assisted by Alan Judge with a cross. Attempt blocked. Adam Forshaw (Brentford) right footed shot from outside the box is blocked. Michael Jones (Crawley Town) wins a free kick on the right wing. Attempt missed. Alan Judge (Brentford) right footed shot from outside the box misses to the left. Attempt missed. Alan Judge (Brentford) right footed shot from the left side of the box is close, but misses to the right.